AS Otoho qualifies to the group stages of the CAF Confederation Cup after a 3-2 win on aggregate. 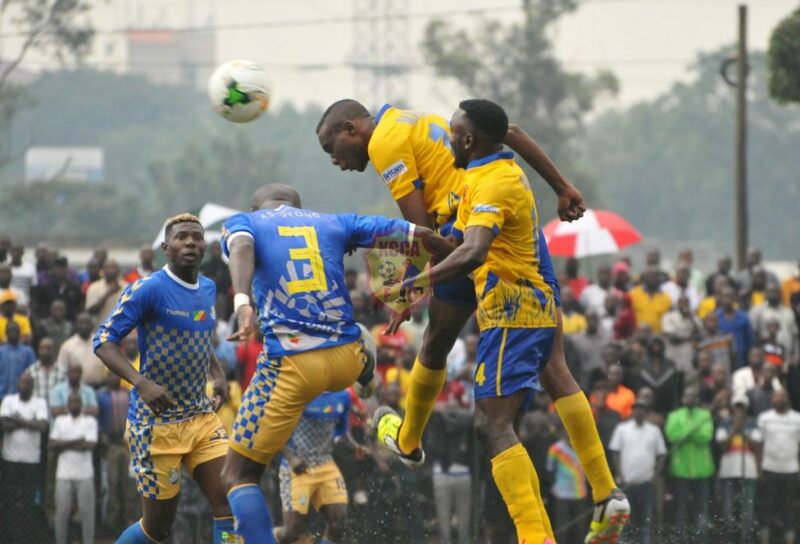 KCCA FC were 2-0 winners against Congo’s AS Otoho in a CAF Confederation Cup game held at Startimes Stadium, Lugogo but fell short on qualification due to a 3-2 aggregate. AS Otoho carried a three-goal advantage in the second leg and from the onset KCCA FC knew it was going to be an uphill task to overturn the result and the rainy evening made it more complex. Patrick Kaddu’s 63rd minute header and a late Allan Okello penalty was all KCCA FC fought hard to get on a soaked astro turf. Hassan Musana got cautioned inside two minutes after kick off for a foul on Fred Ngoma, Lukwago saved the resulting freekick minutes later. Like a knife through butter, Muzamiru Mutyaba weaved through a forest of legs and shot towards goal but custodian Ngobo Mongondza saved. Julius Poloto leaves AS Otoho skipper Magnokele Bissiki for dead. At quarter an hour of play, Kaddu attempted an overhead kick but the ball went straight into Ngobo’s hands. Peter Magambo a CAF home debutant for KCCA FC then got cautioned for a foul on Tilton Boris on 28 minutes. With 10 minutes to play in the opening stanza, Kyambadde beat his marker by pace and was brought down by Lakolo Herman in the 18 but to everyone’s surprise the referee waved play on. Four minutes later, Mutyaba struck a shot that was acrobatically parried away by Ngoma. After recess, Kyambadde outpaced the entire backline and shot wide with the keeper to beat. Six minutes later the forward had a chance to make amends but shot in the hands of Ngoma. Kaddu then came to life and reduced the deficit three minutes after the hour mark from a beautiful pass off Gift Ali. AS Otoho’s Cisse Moussa replaced Arci Saint as KCCA FC’s Julius Poloto made way for a fresh and fast Muwadda Mawejje. Hardly had he entered the field of play when he caused trouble for the opposition. He beat opposition with pace and skills and his directedness added a whole new dimension to the tie. Minutes later, KCCA FC’s Mike Mutyaba replaced a limping Herbert Achai as AS Otoho’s Matheus Botamba replaced Fred Ngoma. Allan Kyambadde later got cautioned for a foul on Alou Bagayoko. Kyambadde kept troubling the opposition and in the 87th minute he was fouled by Mandala Konte inside the penalty area, the referee this time pointed to the spot. Allan Okello does the run up before he struck from the penalty spot. Teenager Allan Okello held his nerve and struck the ball in the roof of the net from 12 yards on the 90-minute mark. 2-0 the final score. KCCA FC winning against Congo’s AS Otoho but failing to qualify for the group stages of CAF Confederation Cup on a 3-2 aggregate score.